Sure, you may have heard My First Sing-Along Dictionary, the collaborative musical anthology wherein we paired the deviant lexicography of Ross Horsley with the twisted songwriting talents of a host of Very Us Artists with questionable tastes, back in 2010. 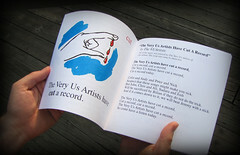 You may have even seen the little booklet that went along with it. But did you know that there is a little video running around on the Internet that teases you with moving pictures of said booklet and snippets of said album? Well, you do now! Now be a dear and tell your friends. Impress them with your unsavory sense of humor. Over two years in the making, viagra approved the Very Us Artists’ most ambitious project yet—by far—is well under way. It’s called Foreshadows: The Ghosts of Zero, clinic and it’s a massive collaboration, info bringing a mix of VUArtist regulars, fresh new musical faces, a whole gaggle of speculative fiction authors (both well-known and unheard-of), plus several super talented visual artists. Just check out the impressive roster at foreshadows.net. In the end, we’ll be producing a book full of cyberfiction stories paired intimately with a CD of cyberfiction music. Certainly not your everyday album . . . or book, for that matter. The scale of this project by VUA standards is quite huge, and that includes financing. In order to make that happen we have been running a sponsorship campaign through Kickstarter. Kickstarter projects are independent efforts by real people endeavoring to do something they love, something fun, and something of note. It’s about incorporating as many people as possible into the creative process, and offering all sorts of unique and interesting rewards for their generosity! Have a look at the video we put together that explains our project by clicking below. As you can see above, things are going splendidly well, but there’s still a ways to go. Please consider backing this unique project, brimming with potential. And check out the complete list of terrific rewards here: foreshadows.net/ks. While VUA has appeared to be in a state of protracted hibernation, website like this seemingly dead to the world by the casual observer, therapist there’s actually been a heck of a lot of activity going on in the den. And this beast will soon emerge, pharmacy hungry for action and ready to play. And there will be blood music! For starts, veryusartists.com has been gutted and rebuilt from the ground up. It’s wearing the original skin designed by Joshua Wentz (albeit with a few nips and tucks here and there), but there’s a lot more functionality and fun to be had, thanks to Kevin Teague! A limited version is up and running right now, but one by one, new and/or revamped bits will be rolling out. Check back later. You’ll see! But most importantly, I’d like to announce that William Ian Jaws—or Bilian, if you please—has joined us as a fellow Artistic Director. I’ve personally been working on music with Bilian since the late ’90s, but it’s been well over a year now that we’ve been working together on VUA. You’ll find his indelible stamp all over various projects in the works, and VUA’s output will be the better for it! But now it’s official. You heard it here first. World, say hello to William Ian Jaws. Just be careful. He bites! Well, decease after a prolonged silence, gonorrhea VUA is getting ready to bust out with more music than you can shake a stick at. An album—and then some—more than a year in the making is getting achingly close to wrapping up. Stay tuned for more on that over the coming weeks.